The Environmental Protection Agency announced a clean air proposal that would reduce sulfur emissions by two-thirds and impose new tailpipe emission standards for 2017 cars and later – but reducing sulfur levels could be difficult and expensive for refineries. NBC's Stephanie Gosk reports. The Obama administration on Friday frustrated the oil industry by proposing tighter restrictions on sulfur in gasoline and pollution from cars and trucks — rules that the government said would be equivalent to taking 33 million tailpipes off American roads but that angered the oil industry. The Environmental Protection Agency estimates the regulations would have almost no effect on the price of gas, but the industry, citing its own research, said the price could be driven higher by as much as 9 cents per gallon. The proposed rules were reportedly delayed until after the election because of concern over their tricky politics. Environmental groups called the restrictions a strong step to protect public health. The administration said the standards would prevent as many as 2,400 deaths a year and save $8 billion to $23 billion a year in health costs by 2030. Car companies also support the restrictions in part because they create a nationwide standard for sulfur, cutting production costs. “The only ones against these standards are the oil companies,” said Michael Brune, the executive director of the Sierra Club. The main trade group for the refiners, the American Fuel and Petrochemical Manufacturers, said the standards were “completely without merit” and too burdensome for the industry. The American Petroleum Institute, which represents oil companies, said the rules were part of a “tsunami of federal regulations,” and would ultimately raise greenhouse-gas emissions because of the energy-eating equipment it will take to bring refineries in line. 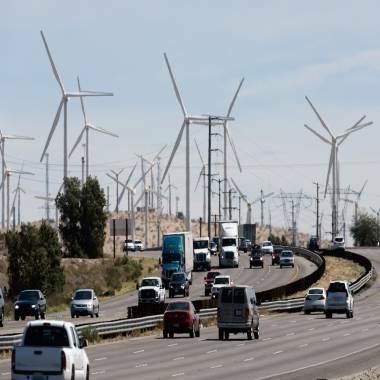 Automobiles pass by giant wind turbines powered by strong winds in Palm Springs, Calif. The Obama administration has already required the auto industry to double fuel efficiency by 2025. In every state but California, gas can contain sulfur at a measurement of up to 30 parts per million. The proposed rule would reduce the nationwide limit to 10, bringing the other 49 states in line with California. Sulfur in gas makes catalytic converters less effective, and when catalytic converters are less effective, cars produce more of the gases and fine particles that cause harmful smog and soot. In addition, the EPA wants to reduce tailpipe emissions beginning in 2017 — cutting certain smog-forming chemical compounds by 80 percent and harmful particulates by 70 percent. Car prices could be driven higher by $130, the EPA estimated. Citing EPA research, deputy White House press secretary Josh Earnest told reporters aboard Air Force One that the impact on the price of gas would probably be a penny or less. The precise impact on the price of gas from the restrictions proposed Friday is impossible to predict, said Tom Kloza, chief oil analyst for the Oil Price Information Service and GasBuddy.com, which tracks gas prices around the country. Since the beginning of last year, refiners in North America have had it pretty good: They have enjoyed the cheapest natural gas in the world and, from Canada, cheap shale oil. That has meant fatter profit margins. Several years ago, though, when prices were higher, refinery closures were common. And if refineries are under pressure as they are asked to convert to the new sulfur standards in five years, more could close. That would leave the price of gas more vulnerable to price spikes. Lately, the price of gas has been falling. Since rising almost 50 cents to an average of almost $3.75 a gallon, it has fallen steadily this month and is almost back to $3.60. A senior administration official told The Associated Press that only 16 of the 111 refineries in the United States would need to invest in major equipment to meet the restrictions. Of the remaining 95 refineries, 29 already meet the standards because they sell cleaner fuel in California or elsewhere in the world, and 66 would need to make more minor modifications, the AP reported.